The Southern husband and I have a long-standing challenge we have set for ourselves, which we affectionately call No Ingredient Left Behind. If we buy a chunk or a bag or a box of something for a recipe and it doesn’t get used up completely, it needs to be finished up in another recipe. It’s led to some interesting suppers around these parts…some less successful than others, and some just plain scrumptious. I give you exhibit A from the second category: Pasta with prosciutto and peas! Here’s what I had lounging around that led to this one. 1. A nice amount of prosciutto from the spinach and cheese tartines that I made earlier in the week. This only happened because I thought I said please may I have a quarter pound of prosciutto when I asked for it at the deli counter, and what came out of my mouth was please may I have a half pound of prosciutto. We’ve been snacking on prosciutto all week. I know, poor us. 2. A hunk of delectable Gruyere cheese, also left over from the tartines. Already grated up. So handy. 3. The rest of a bag of baby sweet peas from the chicken and stuffing baby pot pies I made last weekend. Technically they could have stayed hanging out in the freezer for a while longer, but they worked with this recipe so they were in. 4. The rest of a bag of mafalda pasta that I got from the amazing Fontanarosa’s shop…and all my northern New Jersey friends? Please go there immediately. They make the best ravioli on the planet, and this pasta was homemade there as well. I’m actually in mourning that my bag of it is now gone. I will need to get another bag and start the cycle all over again. On to this super easy pasta, which is a staple on many menus in Italian restaurants. Cook up the pasta (and while I love mafalda, it’s not easy to find in stores ,) so I would recommend pappardelle or fettuccine as a great substitute, and while the pasta is cooking you can start the sauce. You simmer up some cream until it is slightly reduced, and when the pasta is done, pour in the hot cream, chopped prosciutto, peas and the cheese, along with a little pasta water to loosen it up. Stir for just a few minutes until everything is mixed together and warm, and then dish it out onto warmed plates. Grind a little fresh pepper on top and voila! An Italian restaurant fave, right there in your kitchen. 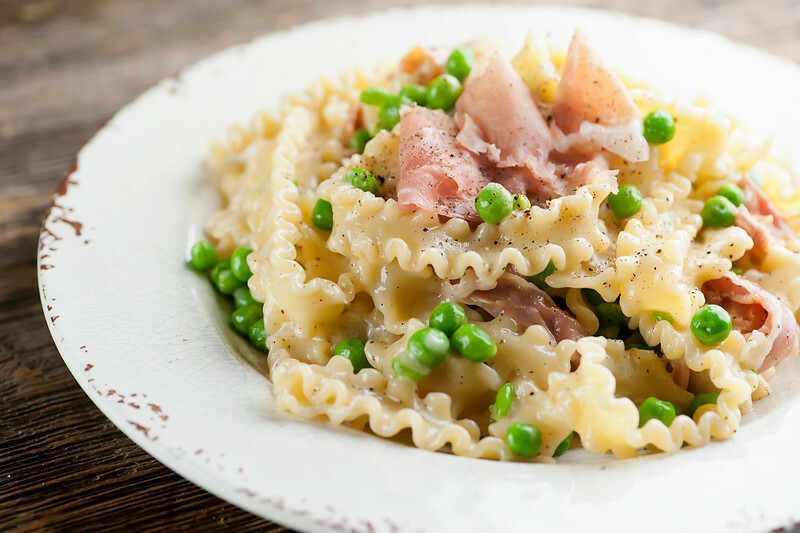 Pasta, peas, prosciutto and cheese come together in this easy recipe for an Italian classic! Cook pasta according to package directions in heavily salted water. Save 1 cup of the pasta water and drain. Meanwhile, put cream in heavy medium sized pot over medium heat and simmer for 5 minutes. Add drained pasta, prosciutto (saving a couple of pieces of prosciutto back for garnish), peas and cheese. Stir together gently until cheese is melted and everything is well mixed, and add just enough pasta water to loosen it up into a light sauce. Divide among heated plates, grind on some fresh pepper, garnish with prosciutto and serve at once. I’m loving this challenge you and your husband have! So creative – and you get to use all your ingredients on hand! But this dish is certainly a winner! I adore simple, satisfying pasta dishes like this! I’m hungry just thinking about it! Love fridge clean-out pasta dishes. This one looks especially yummy! For your excess cheese problem; make blue cheese shortbread thumbprint “cookies” and top with a dollop of fig jam and some chopped walnuts. Very tasty as a snack with some vino. Or as a tasty supper with some vino. I won’t judge! I come here on a daily basis.. first thing I do when I get to work…. you always make things seem so gorgeous and easy. I love how you put things together that I would never imagine and they look and sound absolutely mouth watering. Thank you so much for my favorite part of my day! !